Can crane cranes, including the headgear, be calculated with KRANBAHN cranes? Which profiles are used on cat rails? With the add-on module KRANBAHN, only the main girders, but not the gantry crane itself, can be detected. Also, the head girders of the overhead crane are not detected. In the case of an overhead crane, the parameters for the rail cross section and an additional cross section can be made in the mask 1.3 of the additional module. For a tab, the width a and the height b should be specified. 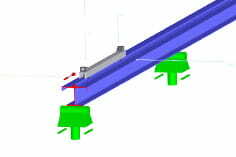 Beam cross-sections made of rolled or welded profiles can be combined as desired with a rail or lug. If the rail profile is too large or the carrier profile is too small, the input can only be continued with a plausible crane rail carrier profile. Select the carrier in [Library] or define it with the button.